Home › Toys › Giant Pandas Plush Stuffed Animals - 18" Teddy Bear With Baby Panda - Kids To.. Giant Pandas Plush Stuffed Animals - 18" Teddy Bear With Baby Panda - Kids To.. Looking for the Perfect Stuffed Animal Gift? ... Then this super soft panda bear set is just the ticket! - Seated, the large panda measures 18 inches tall x 15 inches wide x 13 inches deep. It is big enough to wow and yet modest enough to not take up the entire bed or closet. - The baby panda is detachable and can be played with separately. 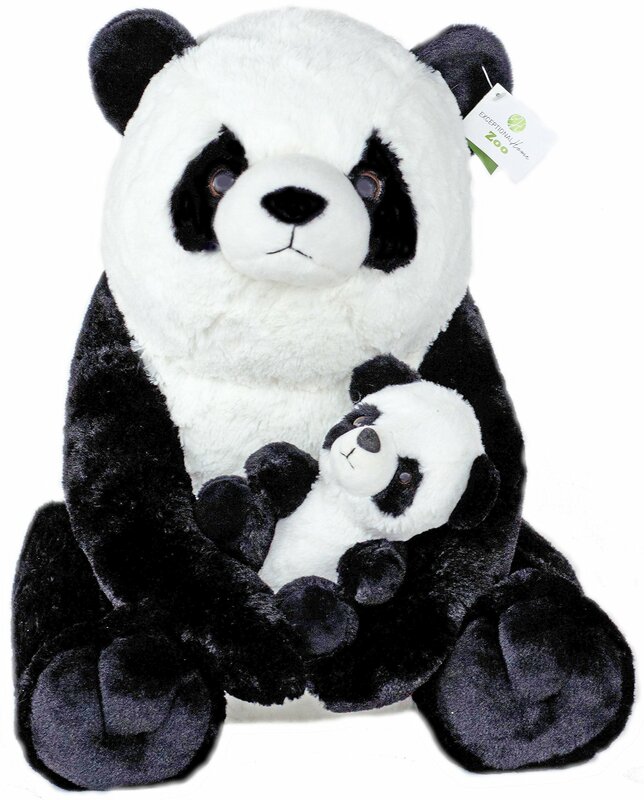 - This set has received the Children's Products Certification (CPC) Exceptional Home Zoo searched the planet for the softest high-quality plush material The panda set has realistic details made from unbelievably soft black andwhite fabric. Words cannot describe the incredible velvety texture. You needto feel it to understand... and then fall in love. Please see the Five Star Review from Amazon's 1 Hall of Fame Reviewer in the feedback below... About Exceptional Home Zoo Exceptional Home Zoo is in constant search of exceptional stuffed animaldesigns. Their research includes testing samples of different sizes andmaterials from around the world. They then take their finds to experts in thetoy field to see if the items are worthy of being part of the Exceptional HomeZoo family. Adult tested, children approved. Exceptional Home Zoo offers a100% money back guarantee or a replacement free of charge. Don't miss out on giving someone the Best Gift Ever - Click on "Add to Cart" and "Place Your Order" to experience the exceptional!